When some resorts get into old age, they start looking a little creaky and tired. At the glorious Boca Raton Resort in southern Florida, however, the grand dame looks fantastic in her late 80s. It always seems to look perfectly beautiful here, no matter what’s new and what’s been added. This was my second time staying here—the other was five years ago—and it was even better this time around. 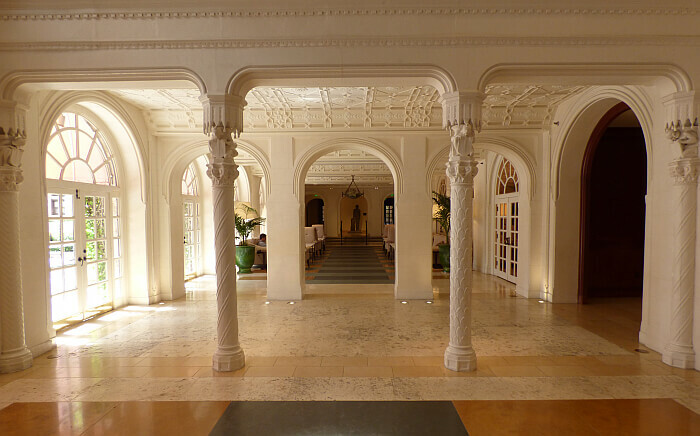 The owners continually invest in improvements and renovations and the most recent was extensive work to the oldest building on the property, $30 million of improvements from the grand lobby up through the rooms originally built in 1926. Before that there was a $120 million renovation to the Beach Club and rooms. This is a huge resort of more than 1,000 rooms and 2,200 employees, but it seldom feels that way. That’s because this is really a collection of buildings under one umbrella and guests are dispersed to different areas and even different swimming pools. 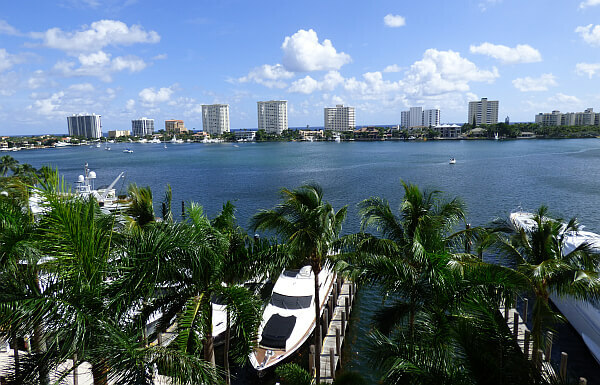 There’s the main Cloister building, with its Mediterranean and Moorish touches, the Yacht Club beside the marina, the more modern Tower with its panoramic Boca Raton coastline and golf course views, the Bungalows, and the Boca Beach Club. Here’s a quick tour for a taste of the variety. The original owner purchased the property before the days of air conditioning and a stampede to Florida and there are 356 acres of prime real estate containing conference facilities and two 18-hole championship golf courses. 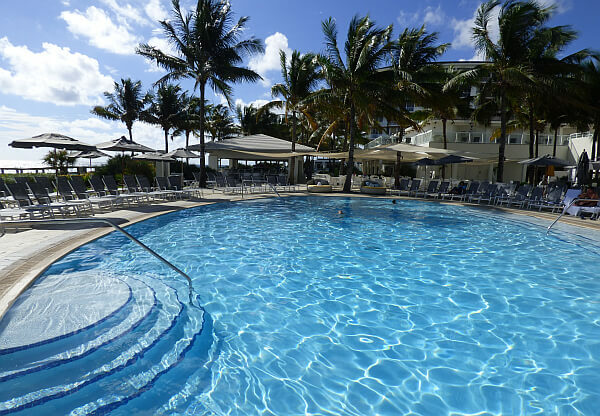 The Boca Beach Club faces a long stretch of white-sand beaches and has several swimming pools with cushioned lounge chairs and cabanas to rent. The two areas are separated by the Intracoastal Waterway, so a shuttle bus goes back and forth continuously and there’s a less frequent water taxi for a more scenic route. You could stay here for a week and not even start getting tired of the food since there are 15 bars and restaurants scattered around the property, from the intimate Mizner’s Monkey Bar cocktail lounge to the Lucca Tuscan Trattoria. Morimoto’s Sushi Bar gets raves from the faithful and “the blue” seafood restaurant on the 27th floor of the Tower really shows off the prime location with its views. Two of the big draws here, the golf courses and the spa, are both worth the trip. 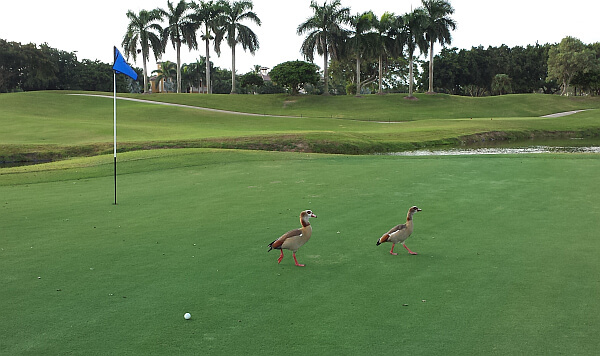 I played the expansive golf course and teed off in the company of herons and egrets. The course was impeccably maintained and carts have built-in GPS devices to estimate distance to the flag. There are plenty of staffers to get you set up for departure, a good driving range, and water stations placed along the way. While I was enjoying all that, I sent my wife to check out the spa. Influenced by the grandeur of Spain’s Alhambra Palace—a palace meant for the country’s last Muslim emirs—it boasts lovely gardens, high arches, polished marble, tile mosaics, carved stone and cypress woodwork. She felt as if she had stepped into a hamam of a Turkish harem. There are a total of seven swimming pools, an extensive fitness center, a croquet court, bike rentals, a surf school, and the fun Flowrider wave simulator for kids by the Tower Pool. With all the facilities on site, many guests don’t spend much time in their rooms. The accommodations are luxurious and comfortable, however, with a large variety of configurations and views to choose from. Around a third of the rooms are in the original building, just coming off an investment of $100K per room to update everything, add new furniture, and install rain showers. Another 242 rooms are in the Tower building, where all have a private balcony. The 212 rooms at the Boca Beach Club overlook the Atlantic Ocean. My stay this time was in a Yacht Club suite, seen in the photo above. Most have similar high-end amenities, but the Bungalows flanking the golf course are more like one-bedroom apartments with full kitchens. 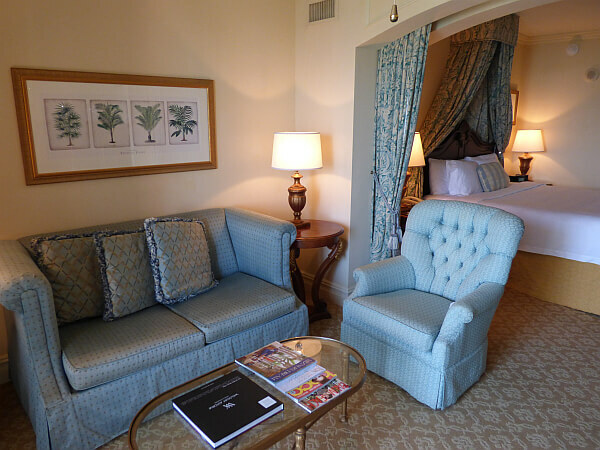 The Boca Raton Resort is a Waldorf-Astoria property, which means you can use or earn Hilton Hhonors points and make use of your loyalty status. There are, refreshingly, almost no corporate touches in the rooms themselves or the dining outlets though. You get the best of both worlds in terms of quality training programs and an easy reservation system, but a strong heritage and the kind of architecture that has become exceedingly rare in new builds where every square foot of space has to have a revenue justification. Here there are beautiful spaces around every turn. It all contributes to a resort that continually wins awards as one of the best in the USA. Be advised that if you don’t have a really high net worth and you get uptight about a $27 mandatory resort fee and $35 a night for parking, this is probably not the hotel for you. Rooms generally start around $299 (and can dip down to $199 for a standard in low season), but you can easily drop a grand a night staying here if you play golf or use the spa. Look around at the clientele though and most of them pulling up in their Lamborghinis or flying in from New York just for the weekend aren’t likely sweating the menu prices. 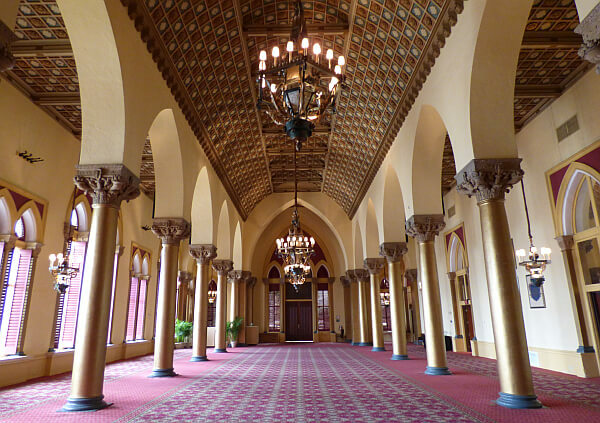 They know they will find indulgent facilities and excellent service here at the legendary Boca Raton Resort, just as it has always been. See more at BocaResort.com and book there, through the Hilton site, or at Expedia. Review and photos by editor Tim Leffel, who was an invited guest of the property for one night. You lucky guy. What a lovely way to spend some time. Did they have to pry you out? Yeah, that’s a tough place to leave!